A Polar Bear (sometimes known as a sea bear) looks directly at the camera as it walks on the icy fringes of Hudson Bay in Churchill Manitoba. This is the largest land predator in the world as well as one of the most vulnerable species in the world. The polar bear (scientific name Ursus maritimus) is a vulnerable species, and five of the nineteen populations are considered in decline. This is mostly due to rising global temperatures affecting the ice melting in the arctic and also due to the lack of food as they mostly eat seals and they are in decline as well. Everyone has seen pictures of a polar bear stuck on an ice flow in the middle of a vast sea of water that is supposed to be ice and the fact that the bear cannot find food is what is making this species so vulnerable, nearly to the point of extinction. 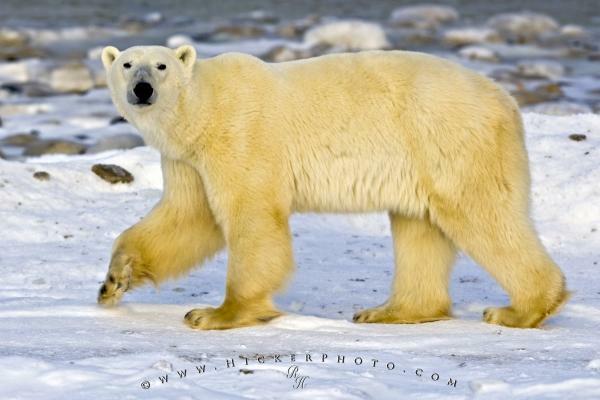 Photo of a Polar Bear aka Sea Bear on the icy fringes of Hudson Bay, Churchill, Manitoba, Canada. 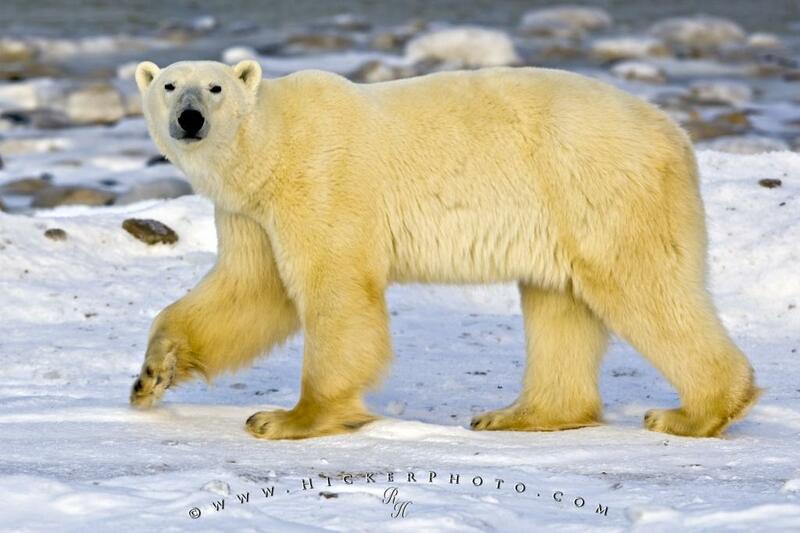 Polar Bears are found anywhere around the Arctic Ocean and the surrounding seas. As there is not a lot of human development in the Arctic circle, that is at least one problem the Polar Bears do not have to deal with, but as the earth's temperature keeps rising, their habitat keeps getting smaller and the danger for their livelihood keeps getting bigger. I photographed this photo with the digital SLR camera model Canon EOS-1Ds Mark II, aperture of f/6.3, exposure time of 1/640 sec. on ISO 100, as always I used a original Canon Lens, the focus lenght for this picture was 300mm.